We recently came across an article providing practical clothing care tips from Jeeves of Belgravia, cleaners of H.R.H. Prince Charles. A few of his tips were re-share worthy. Enjoy! Waxing and polishing your shoes regularly protects them from the elements. Wipe them clean after each use with a dry, fine cloth to remove any surface dirt. At the end of the day, make it a habit to scrub off grime from the soles and heels of your shoes and air them before parking them for the night. Use a wooden shoetree for dress shoes that are seldom worn and then store them in a cloth bag. Never store or leave your leather shoes in the trunk of your car. Extreme temperature and lack of air can accelerate the growth of mold. Finally, don’t wear the same pair every day. Allow the moisture in your shoes to evaporate. It helps extends the life of your footwear and maintain its original shape. Stains are the great leveler when it comes to neckties. Whether it’s expensive silk or of the regular variety, ties with stains are not acceptable. However, never remove stains on your own. A careless or too enthusiastic attempt to get rid of stains can damage the fabric. Rubbing a silk tie can chafe and discolor it. Applying water or club soda (a myth) can push the stain deeper into the interlinings and work to set it in (especially with wine, coffee, or juice stains). When you spill something on your tie, gently dab the stain using a fine tissue. Dab sideways and not downwards to maximize absorption while confining the size of the stain. The quicker the stain is attended to, the higher the chances it can be removed successfully. If you know what caused the stain and how long it has been there, mention this to your cleaner. It increases the likelihood that it can be removed. In general, suits will last through at least 100 cycles of proper dry cleaning if done by a reputable cleaner. 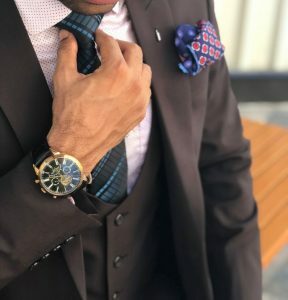 If you wear your suits in an air-conditioned, non-polluted environment, dry clean it after four or five uses, or sooner if it is soiled or stained. When sending suits to the cleaners, bring in both the jacket and pants to maintain the same color shade. Tuxedos, dinner formals, and suits that are not worn often should always be clean when stored. Nothing attracts moths more than perspiration and body oils around the collar. Perhaps the most distressing example of aging is the soda or cola beverage stain —especially slightly visible ones. Left untreated, it turns brown because the sugar syrup oxidizes with heat and time. At Flair, we will make sure your clothes will help you look like royalty.